Tags: "ELI Beamlines now open for business", Another aim is to develop a compact proton accelerator as the basis for a potential cancer treatment system., ELI Beamlines the Czech arm of the project in Dolní Břežany near the capital Prague is the first of the three sites to begin real research work., Half went to Arthur Ashkin for his work on optical tweezers with the other half shared by Gérard Mourou and Donna Strickland for their method of generating high-intensity ultrashort laser pulses., In October 2018 ELI Beamlines reported the "first light" achievement of high-order harmonic generation (HHG) with the facility's L1-Allegra laser., L3-HAPLS system, LLNL ( 153 ), Roman Hvězda said "During 2019 four out of the planned nine workstations will become available to external users., The 2018 nobel prize was of course shared between three laser physicists., The Extreme Light Infrastructure (ELI) project a trio of giant laser facilities across eastern Europe is officially up and running., The ten petawatt laser will be used mainly for astrophysics-related research. The “first shot” at ELI Beamlines was officially achieved in July 2018, on the L3-HAPLS system. Photo: ELI Beamlines. The Extreme Light Infrastructure (ELI) project, a trio of giant laser facilities across eastern Europe, is officially up and running. 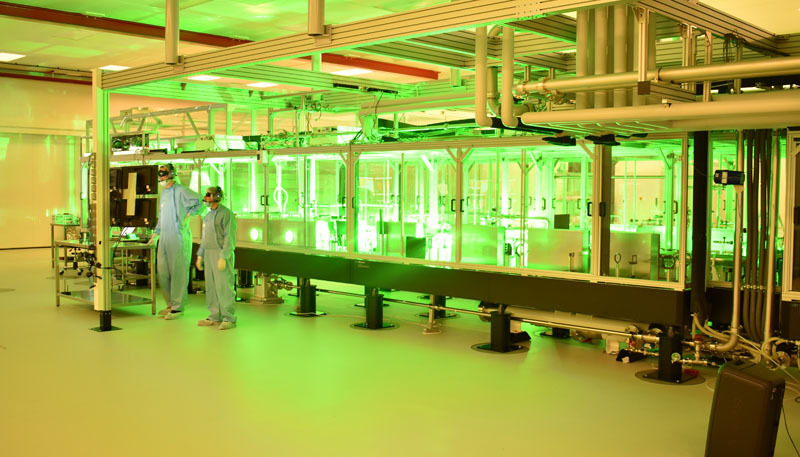 Last year saw ELI pass several of its planned objectives on time and on budget as the sites become some of the world’s foremost high-power laser user facilities. The multi-sited endeavor comprises complementary facilities in the Czech Republic, Hungary, and Romania, built to investigate light-matter interactions at the highest of intensities and the shortest of time scales currently possible. At its maximum output, the most powerful of the systems will be more than six orders of magnitude more intense than the prior state-of-the-art. ELI Beamlines, the Czech arm of the project in Dolní Břežany, near the capital Prague, is the first of the three sites to begin real research work. The end of 2018 marked a significant milestone in the implementation of a site that represents the Czech Republic’s largest single investment in a research and development facility. It also represents the culmination of work that began in earnest in August 2011, following a preparatory phase coordinated by 2018 physics Nobel laureate Gérard Mourou. The 2018 prize was of course shared between three laser physicists. Half went to Arthur Ashkin for his work on optical tweezers, with the other half shared by Mourou and Donna Strickland for their method of generating high-intensity, ultrashort laser pulses. While at the University of Rochester in the 1980s, the pair laid the foundations for ELI with their breakthrough innovation: chirped-pulsed amplification (CPA). Mourou and Strickland’s CPA technique stretches and amplifies low-intensity light, before compressing it back into incredibly short and hugely powerful pulses. Today’s petawatt-scale laser systems use the approach to generate pulses with a greater power than the combined output of every power station in the world – albeit for only a billionth of a billionth of one second. And it is the key technology that makes ELI possible. Mourou himself first proposed ELI back in 2005, and coordinated the project as a bottom-up initiative of the European laser community. In 2010, he co-authored the ELI “White Book”, a blueprint of the key technical proposals and science case behind the project. 2018 proved to be a pivotal year at ELI Beamlines, with the successful installation of three of its four laser systems. 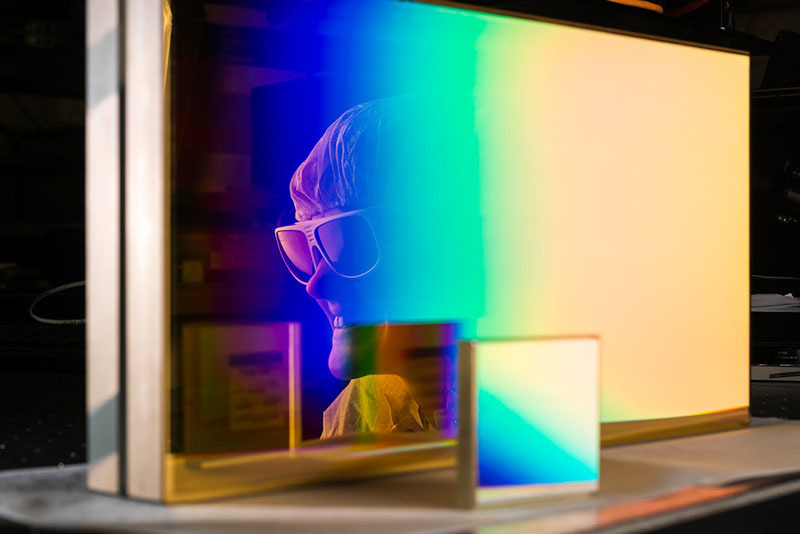 Known as “L1-Allegra”, “L3-HAPLS”, and “L4-Aton”, each represents a significant milestone in worldwide laser development. As of January 2019, more than 300 people are employed at the facility, combining their efforts with a broad and growing international collaboration of users. Those beamlines are now being put to serious research work. 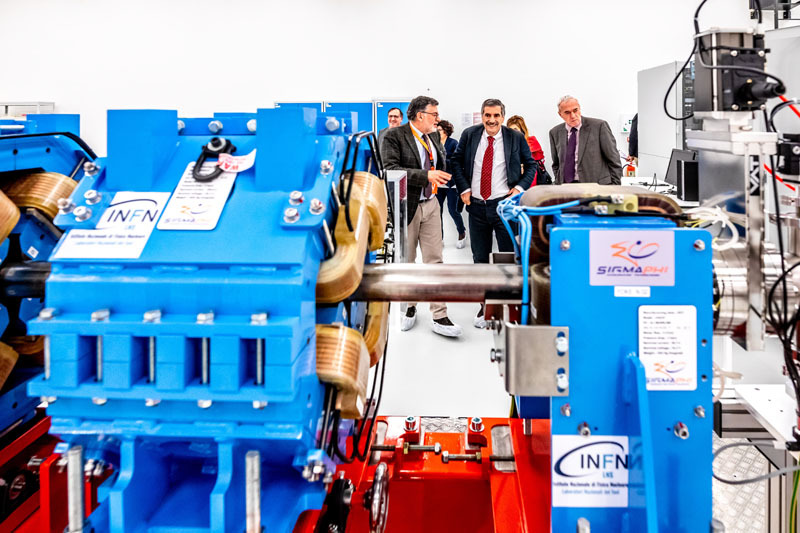 One example of the international collaboration is with Italy’s National Institute for Nuclear Physics (INFN), demonstrated by the delivery of the “ELIMAIA-ELIMED” system for laser-based ion acceleration, and the launch of a high harmonic generation (HHG) source. ELIMED is said to represent a key technology at ELI Beamlines, enabling users to carry out pre-clinical research for future applications including cancer therapy. The short bursts of protons and ions accelerated by the L3-HAPLS beamline, which delivers petawatt blasts at an unprecedented rate of 10 Hz, can be used to experiment on biological systems in a way that has simply never been possible previously. The “L3-HAPLS” beamline, which delivers petawatt-scale laser blasts at a rate of 10 Hz, was declared fully integrated and operational in July 2018. It was originally built at Lawrence Livermore National Laboratory (LLNL), before being packed up and shipped to the Czech Republic. Photo: LLNL. As part of the transition towards user operation, the ELI Beamlines team has delivered 1200 hours of activity to a range of external client users, on four experimental stations. That work has provided the facility with a solid foundation for its first call to the international scientific community. Weeks joined ELI in November 2017, and is now establishing a European Research Infrastructure Consortium (“ERIC”), in order to manage the three different facilities in three different countries as a single legal commercial entity. Turning to ELI Beamlines, the first active ELI facility, he added: “The Beamlines teams have started operations on time and it is certainly impressive. They have delivered almost exactly what they said they would, when they would, in their development plan six years ago. The four different beamlines available at the Czech facility give those users plenty of options. Aspiring to offer the world’s most intense laser system, the L4-Aton line will produce ultra-high peak powers of 10 petawatts and focused intensities up to 1024 W/cm2, at an unprecedented rate of one shot per minute – providing new and unique sources of radiation and particle beams of high utility. Indeed, each of the beamlines is designed to enable groundbreaking research in areas like material science, proton therapy, biomedicine, and laboratory-based astrophysics. Not that simply achieving record-breaking outputs like this is the aim, Weeks stresses. “One of the biggest issues in this field is that while a number of universities have big laser facilities, maintaining and operating these systems ‘on demand’ is very difficult, so availability is generally low – perhaps only half of the time, typically,” he said. ELI employs a team of experienced scientists to help with the design of client experiments, and one of the primary missions at the Beamlines site is using lasers to drive other physical systems such as accelerators. But in contrast to more established synchrotron facilities and their associated user programs, which have been in place for more than 20 years, the laser community is still developing new approaches to accelerator experiments. The major advantage offered by the powerful laser pulses available at ELI Beamlines is that acceleration can be achieved in a significantly smaller space than a stadium-sized synchrotron. And the arrangement should enable new medical applications, for example proton therapy, where the laser itself acts as the accelerator. Inside the University of Rochester’s Laboratory for Laser Energetics, where the CPA technique was invented by Gérard Mourou and Donna Strickland. Here, current LLE student Sara Bucht is reflected in a large grating, shown next to the original, much smaller, grating built by Strickland for CPA while she was a graduate student at the same lab. University of Rochester LLE/Adam Fenster. Weeks went on to explain the thinking behind the plan to establish ELI as an ERIC. “This would give us the flexibility to market our activities across Europe, and enable [ELI] to be used by private client companies,” he said. “However, our main aim is to benefit the ambitions of the main ELI group member countries’ national research initiatives. He also expects to see the ELI approach mimicked elsewhere, and senses an opportunity to drive down the cost of laser-accelerator technology. “I believe we will soon see similar facilities to ELI emerging in the US and in China,” Weeks said. “Furthermore, we will see a faster trickle-down benefit.” Currently the biggest factor restricting greater proliferation is the sheer cost and limited availability of the key components needed to build such high-power systems. In October 2018, ELI Beamlines reported the “first light” achievement of high-order harmonic generation (HHG) with the facility’s L1-Allegra laser. This represented the successful culmination of a year-long installation process. In the first integrated test experiment, the Allegra laser’s front-end output was propagated through the whole system and compressed in a vacuum by chirped mirrors. The resulting laser output parameters included a pulse energy of 1.4 mJ, pulse duration of 14 femtoseconds, a central wavelength of 830 nm, and a repetition rate of 1 kHz. The laser pulses were then directed though a vacuum transport and delivered to the HHG beamline. It was characterized and focused into a 20 mm-long gas cell, showing good pointing stability, a crucial feature for pump-probe experiments with tight focusing. ELI Beamlines is working with partners at the Italian National Institute for Nuclear Physics (INFN) on a laser ion accelerator, for applications including medical research. Photo: ELI Beamlines. He continued, “During 2019, four out of the planned nine workstations will become available to external users. The others will be gradually commissioned, along with a complex commissioning scheme using several petawatt-class [lasers], including state-of-the-art ten petawatt lasers and the combination of beamlines delivering X-rays, electrons, and ions. “Our ten petawatt laser will be used mainly for astrophysics-related research. For example, it will enable researchers to make fundamental observations of ultra-high-intensity interactions, mimicking interactions inside stars. Hvězda added that in mid-2018 he had met Gérard Mourou during the Nobel laureate’s visit to ELI Beamlines with his colleagues from École Polytechnique in Paris, to discuss future involvement and development – as well as the opportunities presented by the newly raised profile of the CPA technique and the extraordinarily high-power lasers now becoming available to users. “We are highlighting his receiving the Nobel prize alongside Donna Strickland to promote our organization, and we hope to attract more government support and activity from across Europe, as well as overseas,” Hvězda said.